A Wholistic Touch offers a variety of techniques such as massage, the Bowen Technique, Healing Touch, Reiki, and Aromatherpy. A particular technique or combination of techniques is decided upon depending on the needs and health goals of the client. Some conditions may be a recent injury or a long-standing condition that has developed into a chronic or acute state. All of the techniques treat the body in a holistic fashion, not just focusing on the complaint but rather as an interactive, interdependent, living system. 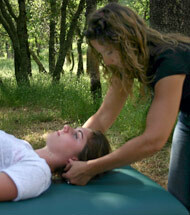 The focus is to balance the body as a whole and to allow it to heal organically. The intelligence of the body knows exactly where and how to direct the energy and it will prioritize it accordingly. During the initial consultation, your immediate needs as well as long term health goals are discussed and a protocol is designed for each person. The number of sessions needed for each person will be discussed at the initial consultation. Light, loose, non-restrictive clothing is best. Sometimes after a session, a wide range of responses can be experienced. People report feeling extremely relaxed even euphoric, some people feel the need to rest and nap while others have energy surges. The release of toxins called ‘detoxing’ is a common response and is the body’s way of releasing chemicals, prescription drugs, and a host of inorganic material. Typically this type of response doesn’t last more than 1 or 2 days. However, since each person’s body is unique in how it processes and heals, experiences may differ. Sessions average 45 minutes to 1 hour. Sessions can also be used for preventative measures -- to help keep the body in a calm relaxed state and enhance the body’s ability to handle daily stressors. Maintenance (regular sessions) is also a supportive adjunct in particular health issues and is highly recommended.